Against a backdrop of sunshine and blue skies storm clouds build. Not long after this image was recorded, the rain began. We made a little trip to Hiram on Saturday to check on the Observatory. It has been stormy and wet lately and the office dehumidifier must be emptied to prevent overflow. Along the way we had a small adventure. 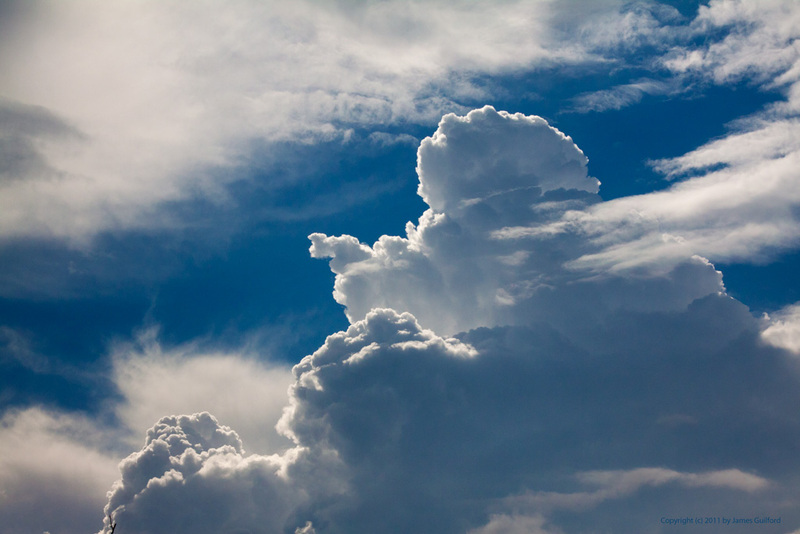 For the past few days we’ve been experiencing periods of partly-cloudy skies interrupted by rain and thunderstorms. We would sometimes see the clouds building as they moved towards us, their bottoms darkening as if heavy with water; then the rains would come. Though it had not rained much near our home this day, in Portage County the situation was much different. A storm had parked itself over the area and, for a couple of hours, drenched the landscape. As we traveled the rolling route south to Hiram we encountered several areas where gravel had washed across the road… sure sign of recent local flooding. Next we came to a low spot where we slowed to a crawl to safely drive through standing water several inches deep. Not long after that we saw red and blue police lights in the middle of the road ahead. There was a gap in the road, edge to edge, a couple of feet across where the asphalt pavement was missing entirely. We detoured and arrived safely in Hiram where all seemed damp but otherwise normal. Duties done we headed for nearby Garrettsville and their excellent Subway restaurant (I mean it, nice people and consistently the best Subway sandwiches we’ve enjoyed). The shop has a front door on the village’s main street and a back door that opens to an extensive deck system that runs along a mill stream through the center of town. The view looking south from a pedestrian bridge over an old mill dam in downtown Garrettsville, Ohio. On the left, water floods the town's old mill spillway. 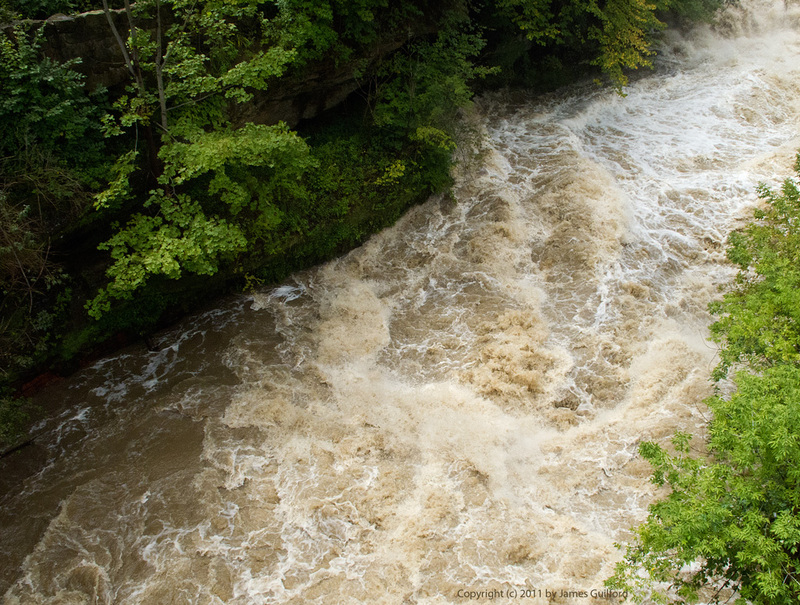 After lunch we stepped out on to the deck and were greeted with surprising sights and sounds — the usually quiet stream flowing gently over an old dam was a raging torrent of brown water tearing through the rock and building-lined channel. The view looking north from a road bridge in downtown Garrettsville, Ohio. The stream crashes over submerged rocks as it rushes towards us in this picture. 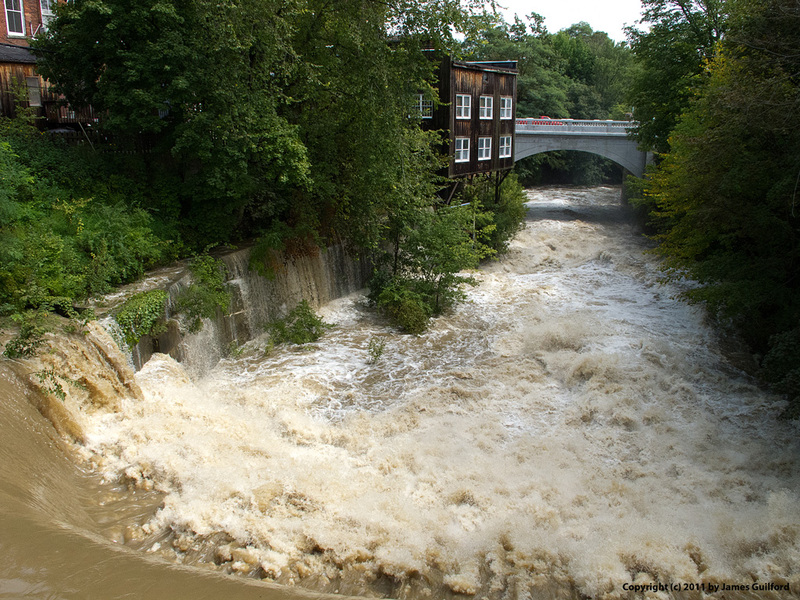 The rushing water roared so as to cause us to shout to be heard; it crashed and tumbled over submerged rocks, and careened down, under and past the town’s new bridge. The sight and commotion drew locals to stop, park their cars on nearby streets, and lean over bridge railings to take in the sights and sounds. Yet as we finally left Garrettsville on our drive homeward, we soon exited areas where there had been tremendous rainfall … as if all was right with the rest of the world. It was a surprising Saturday. Your pictures are wonderful. The sky picture is beautiful. I love that type of cloud. The stream looks ferocious. I can tell it is roaring, just by looking at the picture. Glad you had an adventurous day!